Easter is traditionally the time when everything should be done!! 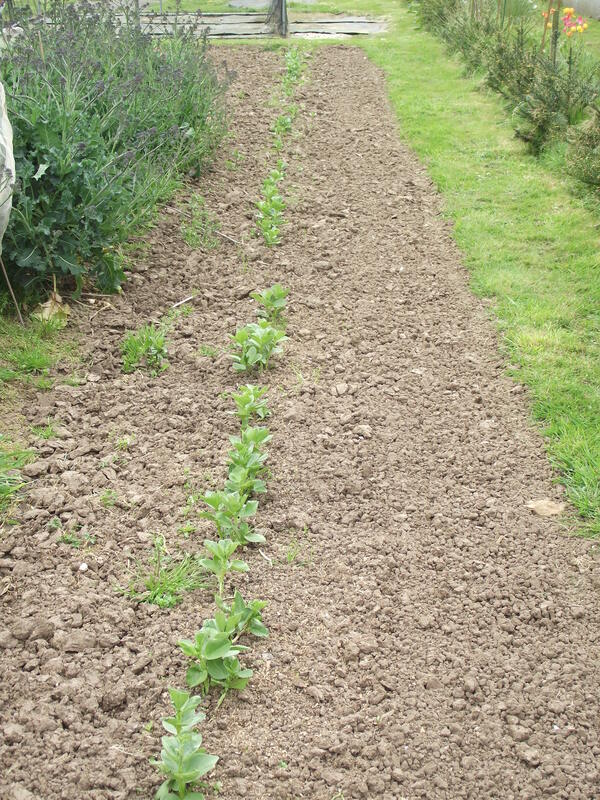 Traditionally Good Friday is the day you plant your potatoes – as it’s a movable date this is more likely to come from the fact its a bank holiday – and therefore the only time when the ‘workers’ have a day off, so they get their spuds in!! Seen here to the left. I am planting them by digging a separate hole for each seed, rather than the backbreaking dig a trench and then rake up the soil. As they grow I will rake up as required. 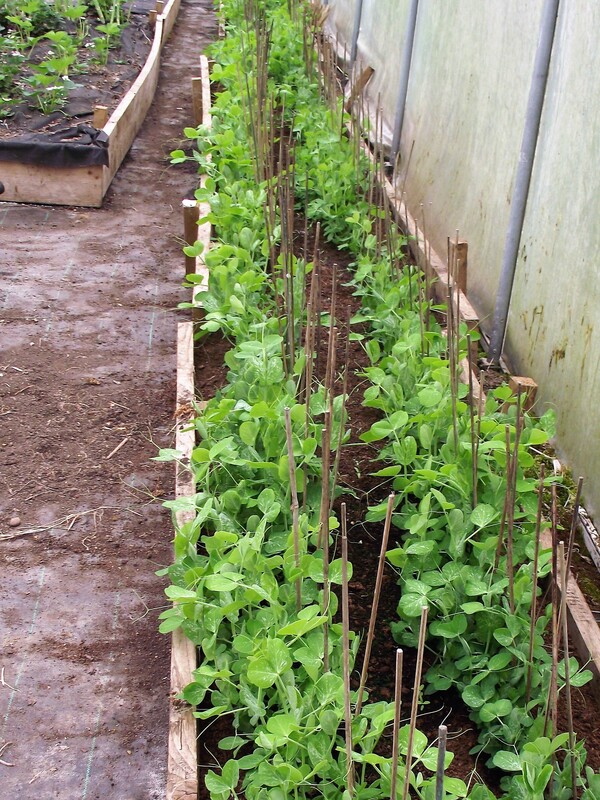 To the left of the spuds I have a row of broad beans, planted under plastic – I expect in a couple of weeks I will be taking the plastic off. 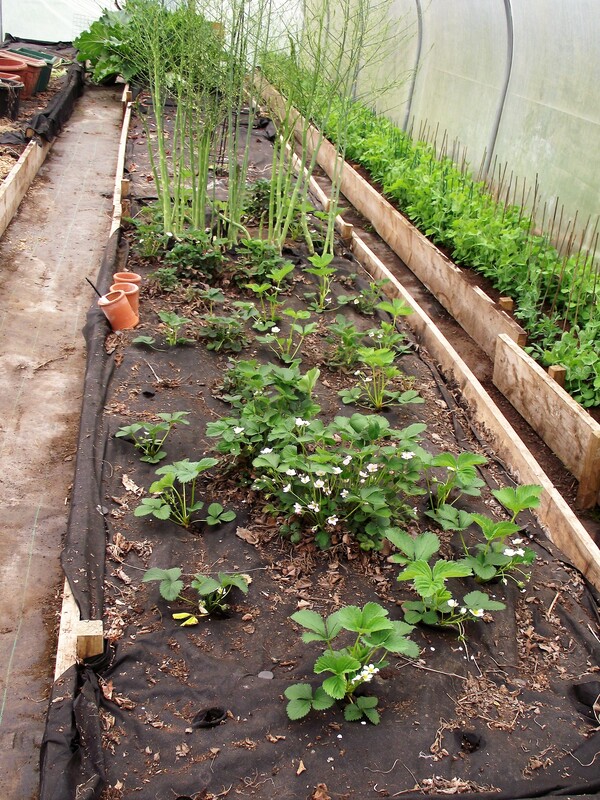 The plastic is there to help germination, but also to protect the seed from the large quantities of mice we have here – the learning curve from last years failures was steep!! To the left of them is my one line of onions, 120 in all (half white, half red). We are still using the onions from last years summer harvest (spring planting), so I reckon we don’t need to grow so many this year. 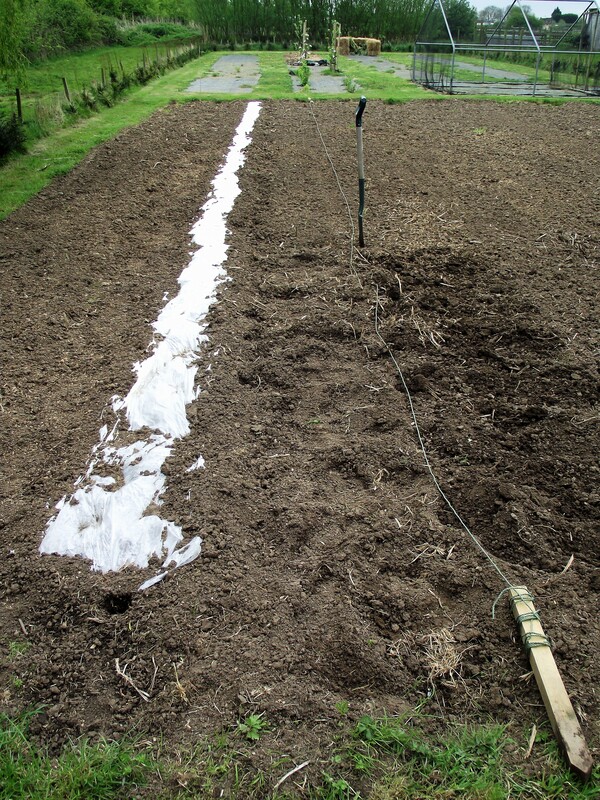 This is the winter planted line of broad beans – with the plastic removed – I think most were lost in the wet weather – the mice then took some when the plastic came off. 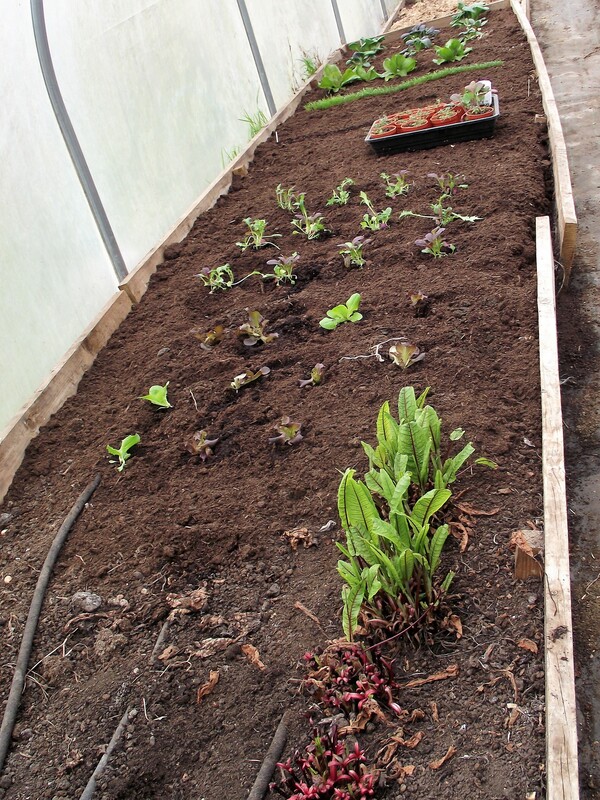 There is enough here to produce a fair few meals though – looking forward to broad beans and diced bacon!! Inside the poly stuff is really getting going……. In the middle the Strawberry plants are flowering – I’m expecting Strawberries in a month or so!! You can see some Asparagus growing madly (it’s the third year – can’t eat it till next year).Behind that is an Aubergine, and behind that a Cucumber. On the right are my pride and joy!!! (I’m sad) the peas……..yay!!! So looking forward to eating fresh peas – and freezing some to cover the Winter. I still think I will get one more crop out of these. I reckon that I will be podding these about late June/Early July (while listening to a test match no doubt) – and I will be able to get another line or two of peas before Winter closes down the light. We will see!! In the middle are the tomatoes – I am about a month behind with these. 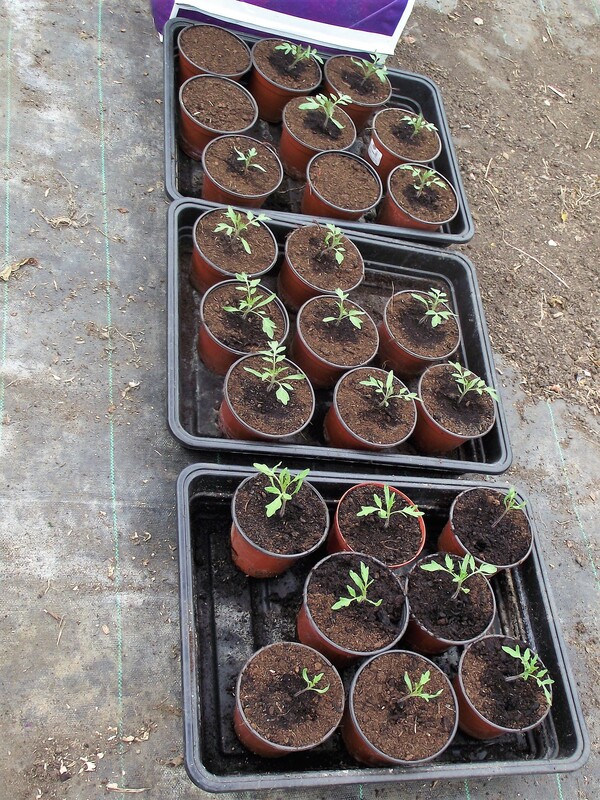 Instead of going in the poly – these are going outside this year – frankly I am fed up with over growing tomatoes taking the poly over so we will see how they do outside – I feel that the wind may ‘do’ for them. We planted a yew hedge 3 years ago – but it isn’t up to height yet to make a sheltered growing environment. 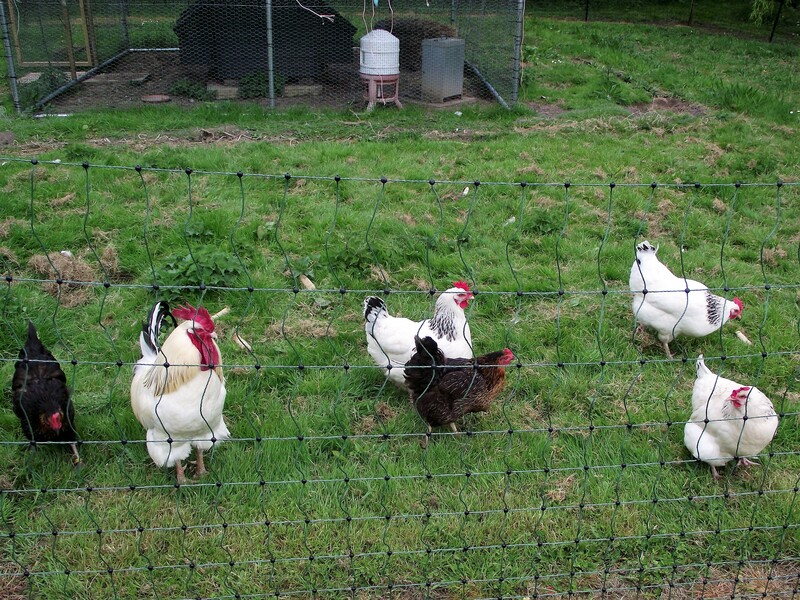 All Avian Flu restrictions have been lifted in England now, so the birds can be out and about. However our girls are in their field at the moment as they are having medicated (anti worm) food presently, and we want to make sure they are eating it. We have one poorly chook currently – we have done all we can for her – even bathed her to clean her up – but I think we are going to lose her – she is in no pain and still has some quality of life. Easter is also time when the tractor gets dug out of its hibernation and set to the tasks at hand. Sadly I got no joy this year when I turned it on – it seems the battery was entirely dead. Ordering another online, with next day delivery, 3 days later in the darkening evening it turns up. Opening the clearly marked package (Liquid – keep upright) I got lovingly splattered with battery acid. Nice. I’m concerned this no maintenance battery must have been chucked about so much that it leaked – well on a tractor by definition it will get chucked about. We will see. We can’t do without a tractor the pastures need to be topped regularly to keep them in good condition and the grass to a height the Alpacas will eat it. 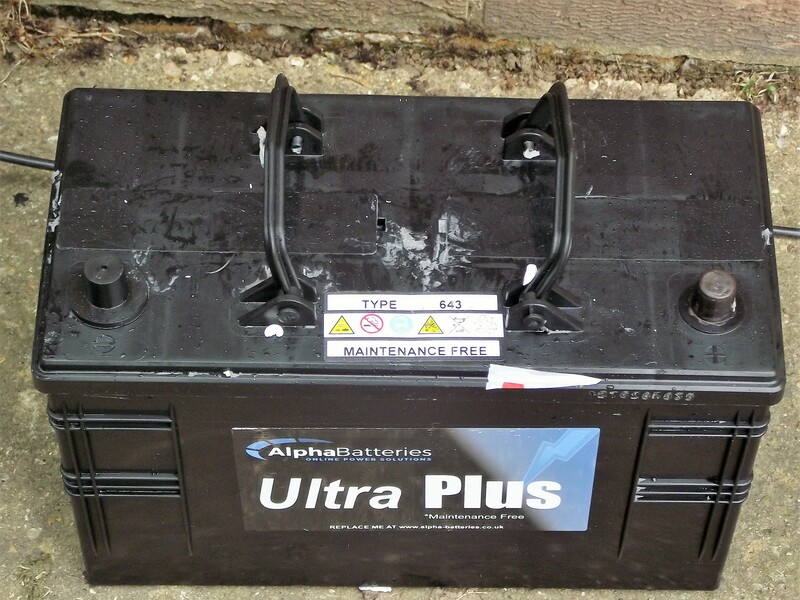 Hopefully this battery will do the job – I can’t tell currently because its outside with the spilt acid drying off. On a sad note I heard today that our small holding friend Adrian died last week – significantly earlier then we were led to believe when he told us his Cancer prognosis. Adrian kept his sheep on out bottom field and was the first person to make us feel welcome when we arrived 6 years ago – and was always around to help us with this machinery or get his chaps to build stuff for us. Thank you Adrian for your friendship.